We’d love your help. Let us know what’s wrong with this preview of The Cactus by Sarah Haywood. To ask other readers questions about The Cactus, please sign up. Why oh why has this book about British characters been edited to use the word ‘Mom’ instead of ‘Mum’! I nearly stopped reading because it annoyed me so much. The good reviews it has on here have persuaded me to try and ignore this offensive Americanisation of British literature, but really is this necessary?! Can the Americans not accept the use of British culturally appropriate words in British books!!?! Ridiculous! The Cactus is a book that comes with such a visually stunning cover, it is filled with flourishing cactus plants, set against a shimmering metallic background and I will admit that it won me over instantly. I also adore the cover tagline that adds further embellishment to this already spectacular cover. The Cactus is comes with the cover quote “It’s never too late to bloom”. 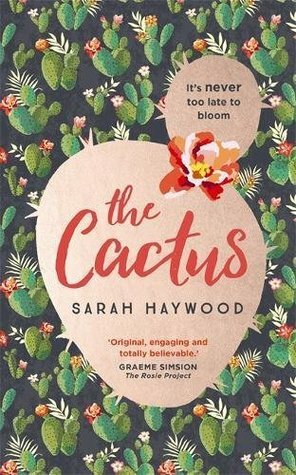 Self acceptance and life changes at a mature age are the central themes that dominate The Cactus, the debut novel from Sarah Haywood. I tend to shy away from book comparisons, but this is a novel that echoes the work of the great Graeme Simsion of The Rosie Project (he endorsed the front cover). The Cactus also reminded me somewhat of another debut I loved last year, Eleanor Oliphant is Completely Fine. But, The Cactus is a novel that easily makes its own mark and it will worm its way into your heart. The apt title of the book refers to the lead, Susan Green’s love for cactus plants, which she keeps in her work office. It could also be seen as a metaphor for the bristly nature of the heroine of the story. Susan Green is the peculiar protagonist who sits at the helm of The Cactus. When the novel opens, Susan is forty five years old, she is a fiercely independent woman, who is set in her ways. With a functional London flat, a long standing career and a relationship that has strict ground rules, Susan’s carefully ordered life is just as she wants it. Until one day, her world comes tumbling down. The death of her mother follows the news that Susan is also in the family way. The Cactus follows Susan as she grapples with getting her head around the prospect that she is to become a mother, which introduces her to whole new set of testing experiences. Life for Susan Green suddenly becomes very complicated. It was an immense pleasure to be introduced to the writing of debut novelist Sarah Haywood. The Cactus is a novel that I can easily attest to enjoying from cover to cover. Much of my adoration for this novel comes from the lead, Susan Green. I will make it clear that some will not warm to Susan straight away, or not at all. Her spiky, feminist, forthright and often odd nature may get under the skin of some readers, but for me, I loved her from the start. Some reviewers have remarked on their inability to connect to such a cutting character, but persisting with Susan really does pay off. I enjoyed the metamorphosis of Susan very much. I liked the mystery that surrounded Susan, which hits you smack bang in the face in the first pages of the novel. I liked how Susan was represented by Haywood as a puzzle or enigma. My money was on some kind of trauma from an accident (I was somewhat close in my estimations) and then I gravitated towards Susan sitting on the autism spectrum. Either way, I enjoyed the chance to get to know Susan. As the book progresses we learn more about Susan’s childhood and life as a young adult through the flashbacks that were included in this novel, as well as her interactions with the delightful characters in this novel. It becomes apparent that Susan is a very quirky woman set in her ways, but at times, her reasoning did make sense and even seemed rational. I admired her for sticking to the routines that made her feel safe. All the same, it was thrilling to see her break free from her restrictions and live in the moment in the latter stages of the book. Supporting Susan is a fine cast of individuals who are all fully fleshed out characters. Protagonists such as Susan’s brother Edward, memories of her mother and father, aunt Sylvia, her twin cousins, neighbour Kate, friend with benefits Richard, university pal Brigid and finally Rob are all so full of life they burst out from the pages of this novel. As the book is solely narrated by Susan in first person, we get an excellent feel for these characters in the eyes of Susan. Her observations of the people in her life are sharp, nuanced and even a crack up at times! The Cactus is a book that I would definitely say is a character dominated novel. The narrative, which mainly revolves around the battle for Susan’s mother’s inheritance and Susan’s impending motherhood, shapes itself around the character set of this delightful novel. In terms of themes, The Cactus works well to draw our attention to a number of issues. Within the novel, Haywood examines memories, upbringing, sibling rivalry, alcoholism, serious illness, grief, lost love, inheritance disputes, marital problems, single parenthood, adoption and mature age pregnancy. Each of these themes are coloured in perfectly by Haywood. I appreciated the lens in which Haywood puts on these topics, through the unusual guise of Susan Green, the lead. On the whole I loved this novel, very much. There was only one small drawback. The book beats slowly. It took me much longer than usual to get through The Cactus but I did seem to savour every word. However, as a fast reader, this aspect of the book perplexed me! Despite my reservation about the slow pace, I took great joy in being a part of Susan’s rise. It really was a touching experience to watch her grow into her own and embrace all facets of her life. The final message I took from this book is that it is never too late to bloom, do not let life pass you by! The Cactus is a simply wonderful debut. Sarah Haywood definitely has a new fan! Die Charaktere in diesem Buch sind alle glaubhaft und liebevoll gestaltet. Vor allem mit Susan konnte ich mich vom ersten Augenblick an identifizieren: ich mag auch keine Menschen. Ich mag keine Überraschungen oder plötzliche Ereignisse. Ich habe gerne Struktur in meinem Leben und die Kontrolle. Wenn also irgendetwas diese Struktur stört oder gar kaputt macht bin ich zumindest erstmal mit der Situation überfordert. (Das hat natürlich alles seine Gründe, auf die ich hier jedoch nicht näher eingehen möchte.) So konnte ich Susan sehr gut verstehen. Auch ihre Handlungen konnte ich sehr gut nachvollziehen, denn ich hätte genauso gehandelt. Das Buch ist aus der Sicht von Susan geschrieben, was dem Leser ihre Gedanken und Gefühle sehr nahe bringt. Dadurch wird vielleicht auch Lesern, die völlig anders sind als Susan, ermöglicht, sie und ihre Welt zu verstehen. Der Schreibstil ist flüssig und lässt sich sehr gut lesen. Wäre die Schrift nicht so klein gewesen, hätte ich das Buch vermutlich an einem oder zwei Abenden durchgesuchtet. Wem es also mit kleiner Schrift geht wie mir, sollte vielleicht lieber zur E-Book Variante* greifen und die Schrift entsprechend vergrößern. Die Story hat mich sehr berührt. Obwohl Susan keine Emotionen mag, fand ich die Geschichte sehr emotional. Sie hat mich immer wieder an Situationen aus meinem eigenen Leben erinnert und ich habe mich mehrmals dabei ertappt, wie ich beim Lesen genickt und "Ja" oder "hätte ich auch so gemacht" gesagt habe. So, let's talk about that cover. It's absolutely sublime, and I have to admit that as soon as I opened up the envelope when it dropped through my letterbox, I bumped this one to the very top of the 'to be read' pile. See, I'm a cover tart, I have to admit it. There is nothing more likely to get me interested in a book than a beautifully produced cover, and especially a hardback cover. I was truly besotted. The contents of the book certainly do not disappoint either. Yes, we can certainly judge th So, let's talk about that cover. It's absolutely sublime, and I have to admit that as soon as I opened up the envelope when it dropped through my letterbox, I bumped this one to the very top of the 'to be read' pile. See, I'm a cover tart, I have to admit it. There is nothing more likely to get me interested in a book than a beautifully produced cover, and especially a hardback cover. I was truly besotted. The contents of the book certainly do not disappoint either. Yes, we can certainly judge this book by its cover. It is just as beautiful on the inside as it is on the out; perfectly written and paced, with a lead character who will bring out every emotion and feeling for the reader. The Cactus is the story of Susan Green. At first, she doesn't seem particularly likeable and to be honest, I'd hate to sit next to her in the office, but gradually and slowly, this very talented and gifted author brings her to life. The reader is allowed glimpses from Susan's childhood, and early adulthood and these make it very clear that Susan really is a product of her upbringing. One early reviewer likened Susan to the offspring of Don from the Rosie Project and Bridget Jones, and that really is the perfect description. However, I like Susan much more than I like either of those characters, scarily enough I found myself identifying with some of her thoughts and behaviours; I think we all have our little quirks and Susan and I have quite a few in common. At the heart of the story is the fact that single Susan is forty-five and pregnant with her first child. Her mother has recently died and Susan is outraged to find that, according to the will, her brother Edward has the right to stay in the family home until he chooses to move. Susan deals with both of these matters in her organised and military fashion. A baby is just a small person who won't take up much room at all, and once she's prepared her case for the Court, she's bound to get her half of the money immediately, isn't she? After all, Susan has gone through life so far in her own tenacious fashion so there's no reason that this won't work out perfectly for her. What Susan doesn't consider is that huge changes that both pregnancy and bereavement will bring to her. Suddenly, she is experiencing emotions and feelings that are alien to her, and her journey to realisation about relationships is wondrous to experience. Sarah Haywood has created one of the most wonderful characters that I've ever come across. She is perfectly formed, both interesting and irritating at times, but by the end of the story, I was totally and utterly in love with her. The Cactus is a joyful, funny and very insightful story. Incredibly well written and wonderfully imagined. Effortlessly entertaining with captivating observations. This really was a joy to read. 🌵 🎧 Yay for great audiobooks with fabulous narrators with ACCENTS! British, in this case. THE CACTUS was my latest listen and it was a great one 💗 I adore quirky characters and this one has that PLUS family drama PLUS love ~ highly recommend to fans of “Eleanor Oliphant is Completely Fine” by Gail Honeyman and “Something Like Happy” by Eva Woods 😊 Both of those are excellent on audio as well, BTW! Ah well, somewhere between 2.5 and 3 stars. And please, please, never ever spell "bin" instead of "been", it does not add any quirkiness to the speech, it just looks stupid. I have to say this book did not live up to my expectations. From the blurb I expected some quirky, humorous, emotional story, very cleverly written, but it turned out to be pretty average on the enjoyment scale. Susan is 45. She lives alone and lives her life whichever way suits her best. She is smart, in full of control of her Ah well, somewhere between 2.5 and 3 stars. Susan is 45. She lives alone and lives her life whichever way suits her best. She is smart, in full of control of her life. She is a real "adult". No fooling around, no being silly. Straight to the point. Responsible. Serious. Her mother dies leaving behind Susan's immature brother Edward and a will for the estate to sort, which, in Susan's opinion, unfairly favours Edward. Needless to say, the siblings aren't close. Emotional knots to untangle, serious matters to consider. I did not feel connected to Susan. Despite her business-like seriousness in every aspect of her life, she came across as terribly immature herself. Emotionally immature. All she does hides her feelings, she is afraid of opening up to life. And it is quite boring. And annoying. Other characters left me rather indifferent as well. The book felt lacking sharp, perky humour, some blazing, something that would spark a reader's interest and have it burning till the very last sentence in the story. This was just ok. This book is perfect in every way and I was really sad when I'd finished. I was engrossed, enthralled, so vested in Susan's life and what was happening to her. What a well-rounded character and how well the author fed the reader the pieces of Susan's past that made her such a prickly character. Her voice was perfect and really made me laugh at her little observations - I could picture the expression on her face as I read her thoughts. So cleverly written and such a lovely warm-hearted story. LOV This book is perfect in every way and I was really sad when I'd finished. I was engrossed, enthralled, so vested in Susan's life and what was happening to her. What a well-rounded character and how well the author fed the reader the pieces of Susan's past that made her such a prickly character. Her voice was perfect and really made me laugh at her little observations - I could picture the expression on her face as I read her thoughts. So cleverly written and such a lovely warm-hearted story. LOVED IT! A 3.5 from me. I enjoyed the book on the whole & it’s our current book club read so will do a full review at a later date. It felt a little like a copy cat to Eleanor Olephant to me. The main character is very similar, especially in the way she deals with people, but I didn’t like her nearly as much as Eleanor and found her rudeness annoying in places. A heartwarming tale but takes a while to get there. This book in the definition of English humor. It should even come with a warning: Don't read it on a rainy morning! I loved every chapter. But the character can get to be a bit too bitter at times. She's a new kind of lol. Oh my word, this book is bloody brilliantl!!!! It starts off a bit like Bridget Jones, and ends a bit like Four weddings - someone please adapt it into a film!!! I didn’t think anything could top Eleanor Oliphant for me because I really, really loved that book and will definitely read it again someday - but this? It’s as good if not better. Witty in that inimitable British way, with undertones of sadness and comedy, it’s just a literary triumph. I’m always a reluctant 5 star rater, but this just co Oh my word, this book is bloody brilliantl!!!! I’m always a reluctant 5 star rater, but this just could not be awarded anything less. I can't begin to review this book without mentioning that beautiful cover. The image above does not do it justice at all. Those pale pink looking bits are in fact a beautiful shimmering foil. This book was a very welcome surprise when it arrived a couple of weeks ago and when I read the back, I knew it was a book I would enjoy. Susan Green is very, very set in her ways, most definitely on the autistic spectrum, When we meet her at the beginning of the book, her mother has just died provoking very I can't begin to review this book without mentioning that beautiful cover. The image above does not do it justice at all. Those pale pink looking bits are in fact a beautiful shimmering foil. This book was a very welcome surprise when it arrived a couple of weeks ago and when I read the back, I knew it was a book I would enjoy. Susan Green is very, very set in her ways, most definitely on the autistic spectrum, When we meet her at the beginning of the book, her mother has just died provoking very little emotional response. She is also coming to terms with the surprising realisation that at the age of 45, she is pregnant for the first time - this was most definitely not in her plan! She enjoys living by herself in her small one bedroom flat but recognises that she will need somewhere bigger when the baby comes. The inheritance from the sale of her mother's house will help with this. However, shockingly and unexpectedly, her mother had recently made a will granting her brother, Edward, lifetime rights to stay in the house. Convinced this cannot reflect her mother's true wishes, she determines to challenge the will. I found it interesting that there is a quote from Graeme Simsion on the cover as Susan is a very similar character to his Don Tillman from The Rosie Project. Like Don, she has a very rigid, ordered way of life which suits her perfectly and little understanding of others. Also like Don, she comes up against circumstances beyond her control which make her uncomfortable but force her to adapt and change. I really liked how Susan gradually had to adapt yet remained true to herself. She was frustrating to read about at times but then I don't have that understanding of what it is to be autistic and her behaviour and reactions were perfectly logical to her. She did make me laugh a lot too though. One example was when she had to go into her neighbour's house to look after her toddler daughter in an emergency situation. She is quite horrified at the state of the house. "I don't see why having children should be an excuse for letting your standards slip. I'd be surprised if my own did." I'm sure that many mothers (and fathers) would have a wry smile at that. I think we all have plans and ideas of what parenthood might be like which change very soon after that little person arrives and turns your life upside down! A thoroughly enjoyable read. Fans of Eleanor Olyphant and Ove will enjoy Susan Green. But there is more here to love than a retread of those books. Watch this character come alive and step out of her comfort zone. You will be rooting for her the whole way despite her prickly exterior. While the publisher's blurb compares this story to "The Rosie Project", it reminded me much more of "Eleanor Oliphant Is Completely Fine" which I thoroughly enjoyed as much as "The Rosie Project". This book has its own set of unique circumstances that made me vacillate between awarding 4 or 5 stars. Susan has always adhered to a very structured life that has given her the sense of control and safety that her childhood did not provide. Now, she is at a juncture, she had not anticipated, being a p While the publisher's blurb compares this story to "The Rosie Project", it reminded me much more of "Eleanor Oliphant Is Completely Fine" which I thoroughly enjoyed as much as "The Rosie Project". This book has its own set of unique circumstances that made me vacillate between awarding 4 or 5 stars. Susan has always adhered to a very structured life that has given her the sense of control and safety that her childhood did not provide. Now, she is at a juncture, she had not anticipated, being a pregnant mom to be. Her strong denial of anything outside her scope of control seems to break through at times but she always creates a semblance of control in each mile post in her life which includes being suddenly orphaned by her mother at this time. The aftermath of her mother's stroke and death leads to new revelations about her place in her parent's lives when her inheritance of half of her mother's estate is split with her younger brother (whom she hates) with one exception, he inherits the childhood home. She suspects he exerted undue influence to gain this key asset. What she discovers is something much more shocking! Meanwhile, as she searches for answers and a means of taking control of the home, she begins developing friendships with people that "slip by" her radar, whom she takes into her confidence and they with her. New insights yield new, unexpected relationships and those things she thought were of the greatest benefit to her, really are not that important. We watch Susan as her new circumstances challenge her and she experiences a catharsis, a maturity in understanding the need for and desire to have meaningful relationships with others. Her deeper understanding brings much joy and greater peace. It is a terrific journey, we partake with her with pleasurable outcomes. I found this book a greater joy than I anticipated with interesting characters and a few twist along the path. Leading a perfectly ordinary life, Susan Green is 45 and is pretty happy with living on her own in a London flat, having a stable job that's ideal for her logical personality and has been enjoying a no-strings-attached arrangement with a guy for several years. That is until she not only finds herself pregnant, but she's also forced to deal with her mother's sudden death and contesting the will against her good-for-nothing younger brother. Susan is now faced with a lot of mayhem in her previously Leading a perfectly ordinary life, Susan Green is 45 and is pretty happy with living on her own in a London flat, having a stable job that's ideal for her logical personality and has been enjoying a no-strings-attached arrangement with a guy for several years. Susan is now faced with a lot of mayhem in her previously ordered life and is forced to confront some home truths along the way. I think that the premise of this book works really well: an intelligent, independent, and capable woman suddenly starts to lose control of her life, as she has to face her family, the loss of her mother, and her unplanned pregnancy. And while parts of this story are inevitably a little cliched (all stories with a happy ending are), the voice of the protagonist is anything but. I loved the originality of the character of Susan, and her distinctive voice, and I particularly loved the way that Haywo I think that the premise of this book works really well: an intelligent, independent, and capable woman suddenly starts to lose control of her life, as she has to face her family, the loss of her mother, and her unplanned pregnancy. And while parts of this story are inevitably a little cliched (all stories with a happy ending are), the voice of the protagonist is anything but. I loved the originality of the character of Susan, and her distinctive voice, and I particularly loved the way that Haywood doesn't make her sacrifice her uniqueness in order to find her happy ending. With the exception of one particular conversation between Susan and her neighbour Kate about feminism, which (while I completely agree with the author's sentiment) felt a little shoehorned in, I felt that The Cactus struck the perfect balance between relatability and individuality. I would definitely recommend this one, especially if you're in the need of something to cheer you up. Susan, the main character, is a prickly woman in her mid forties. ( Of course, we come to learn that she is a product of her upbringing). She has her life well ordered, with a job that suits her and a flat in London. Her world is turned upside-down when her Mum dies, leaving her brother a lifetime interest in the family home. Susan, having just found out she is pregnant, must set this injustice right. In order to do this, she must start to rely on, and accept help from other people, something sh Susan, the main character, is a prickly woman in her mid forties. ( Of course, we come to learn that she is a product of her upbringing). She has her life well ordered, with a job that suits her and a flat in London. Her world is turned upside-down when her Mum dies, leaving her brother a lifetime interest in the family home. Susan, having just found out she is pregnant, must set this injustice right. In order to do this, she must start to rely on, and accept help from other people, something she has never done before. She learns a lot about herself and what she is capable of. This book has been recommended for fans of 'Elinor Oliphant is Completely Fine' and there are similarities. I do think people who enjoyed that book, will like this one also..
5 stars for the cover - it's stunningly beautiful! But unfortunately only 3 stars for the story! That's not to say I didn't enjoy it as it was an interesting story, but I just didn't connect with the character as I hoped I would and I just felt that the book was missing something although I'm not sure what that was! The main character, Susan Green, is very set in her ways! She's very independent and likes her own routine and seems at odd with the modern world around her at times. She is a fan of 5 stars for the cover - it's stunningly beautiful! But unfortunately only 3 stars for the story! That's not to say I didn't enjoy it as it was an interesting story, but I just didn't connect with the character as I hoped I would and I just felt that the book was missing something although I'm not sure what that was! The main character, Susan Green, is very set in her ways! She's very independent and likes her own routine and seems at odd with the modern world around her at times. She is a fan of the old fashioned approaches to life! She's not on social media to the surprise of her work mates, and is happy enough just getting on with her job and taking care of her Cactus collection. The story then follows her as she deals with the death of her mother, the fractured relationship with her brother thereafter and trying to come to terms with decisions made by others in her past that finally reveal themselves to her - all while she is coming to terms herself with her finding out she is pregnant and determined to raise the child by herself. You definitely see a softer side of Susan as the months tick by - she finds a friend in the unlikeliest of places and the quest to try and contest the will that her mother left also leads to some startling revelations that unsettle her and shatter everything she thought she knew. She has to learn the art of compromise and to think of others and their feelings - something that has never been easy for her to deal with. I enjoyed the times when Sarah was looking back at her childhood and how those events changed her, and overall I found it a pretty enjoyable read. I picked up this book as it was suggested it was similar to Eleanor Oliphant. I adore Eleanor so I was thrilled to hear of this book. However, this is no Eleanor. I found the book's plot to be one that I did not care about. One that I did not want to know the outcome. The protagonist was ho-hum and quite annoying. Oh well....it was worth the try. I really loved this, Susan the main character was a bit reminiscent of Eleanor Oliphant but the story was completely different. Was slow paced but very readable. I wanted to like this book, but unfortunately I didn’t. I read a few chapters and I thought was not what I was expecting. I didn’t finish the book . I’m on a mission to read as many books as possible with “quirky” characters and when Richard & Judy announced The Cactus as part of their Autumn Book Club choices it seemed perfect timing to start this book. Firstly, I absolutely HATE it when books are compared to other books/characters etc and when the Sunday Times said “‘The Cactus will be compared to Gail Honeyman’s 2017 hit, the appealingly eccentric Eleanor Oliphant is Completely Fine” I try to take it with a pinch of salt and read it w I’m on a mission to read as many books as possible with “quirky” characters and when Richard & Judy announced The Cactus as part of their Autumn Book Club choices it seemed perfect timing to start this book. If you were a fan of Eleanor Oliphant is Completely Fine , I think that you will really enjoy, The Cactus ! I really do prefer quirky characters so I was excited to dig into this story about a late bloomer that doesn't necessarily fit in (or want to) with her peers. When she discovers that her mother's will favors her brother over her, If you were a fan of Eleanor Oliphant is Completely Fine , I think that you will really enjoy, The Cactus ! I really do prefer quirky characters so I was excited to dig into this story about a late bloomer that doesn't necessarily fit in (or want to) with her peers. When she discovers that her mother's will favors her brother over her, her world is sent into even more of a tailspin because Susan is unable to exercise any control on this situation. Since her brother gets the house in the will and refuses to move out anytime soon, she decides to take legal action against him, believing that her mother would have never changed her will if she had been coherent. All is not as it seems though and Susan discovers that her mother has been keeping a few secrets that will change Susan's life forever. I can honestly state that this book is unique to any other I’ve ever read .. and it’s a great read! Susan controls every aspect of her life. At forty five, she lives alone – as she likes it – and has a very regimented routine. Her colleagues, by dint of being human, annoy her – well, let’s be honest – most things annoy her. She fails to understand why everyone doesn’t follow her example of a strict routine and maintain a compartmentalised and – in her mind – perfect life. As this story progresses, I can honestly state that this book is unique to any other I’ve ever read .. and it’s a great read! As this story progresses, we find out all about Susan’s back story .. family life, love life, relationships, friends – or lack thereof. There are a few giggles along the way and certainly a few surprises! The ending of the book was astounding – but in a good way. I adored this one. I found myself fully immersed in Susan’s life and to my surprise, entertained. It’s similar to a coming-of-age tale in some ways, definitely addictive and one which I highly recommend to anyone who enjoys a contemporary read. Voor iedereen die wilde dat er meer boeken zouden zijn zoals Eleanor Oliphant. Ontroerend, grappig, verrassend, lief en best heel herkenbaar eigenlijk. Halverwege zakt het verhaal een beetje in, maar dat wordt snel weer goedgemaakt. Overigens denk ik niet dat dit het zoveelste "Asperger is eigenlijk best grappig"-boek is. Susan is proud of being a prickly 45 year old woman who has successfully kept everyone at a safe distance throughout her life. She has carefully organised her relationships, including family, associates and colleagues, to give her space and privacy. She knows that people usually have ulterior motives and she refuses to allow them to undermine her structure. When her mother dies, the will decrees the family house to her hopelessly ineffectual brother which rubs Susan the wrong way. At the same tim Susan is proud of being a prickly 45 year old woman who has successfully kept everyone at a safe distance throughout her life. She has carefully organised her relationships, including family, associates and colleagues, to give her space and privacy. She knows that people usually have ulterior motives and she refuses to allow them to undermine her structure. When her mother dies, the will decrees the family house to her hopelessly ineffectual brother which rubs Susan the wrong way. At the same time, she discovers that she is pregnant with an unplanned child. As she tries to adapt to and tame these unorchestrated events, she is forced to look deeply into her past, which reveals the reasons for her cactus-like demeanor. As the contested will legal proceedings evolve and her pregnancy progresses, she finds support all around and she is given the nurturing needed to bloom. I was somewhat hesitant when I saw this book compared to Britt-Marie Was Here,[since I was not a fan] but Susan is nothing like Britt-Marie. Susan is simply a somewhat neglected child of an alcoholic and she has developed strong coping mechanisms, like independence and solitude, over the course of her life. She only needed a specific kind of love, understanding and attention. I was only disappointed that the metaphor of the cacti wasn't expanded in the end. The Catus is a brilliant read, following main character Susan who is so interesting to read about. She is a very independent, confident person who has firm beliefs and a fairly unique way of interacting with other people. We see, throughout this novel, some of the reasons for the way she behaves around people, and although at first I couldn't imagine ever wanting to spend a significant amount of time with her, by the end of the book I could really appreciate what a quirky, interesting character she is. What you see is what you get with Susan; she's unapologetically stuck in her ways and will change for no-one (or so it seems), and I loved that about her! The story that follows is heartwarming, a little sad at times, but most definitely a wonderful read. Sarah Haywood has moulded some brilliant characters, from Susan herself and her lovely neighbour Kate, to her (extremely unlikable, but very interesting) brother Edward and his brilliantly unique friend Rob - I loved reading about them all! They seemed to jump off the pages at me and I only wish this novel had been longer, because I could happily have read twice, three times as many pages. Oddly enough, Susan refers to her mother as 'mom' instead of the more commonly-used (in England) 'mum' - not sure if that's another quirk of Susan's but it did make me check whether the author is from (she is British) and in doing this I saw Sarah's Goodreads Author page that she is actually writing a second novel at the moment - yay! I'll be first in the queue. ‘Cactus’ is the story of Susan Green, an individual who is very pragmatic. Susan’s organised life changes when she discovers she is pregnant, she surprises herself, when she decides to have her baby. As Susan’s life changes, she faces a loss, from this loss, she begins to see all of her relationships differently and finds herself opening to new experiences. I enjoyed ‘Cactus’, Susan is a memorable character, however, at first, I did not connect to Susan, not that I’m perfect in anyway, we all ha ‘Cactus’ is the story of Susan Green, an individual who is very pragmatic. Susan’s organised life changes when she discovers she is pregnant, she surprises herself, when she decides to have her baby. I enjoyed ‘Cactus’, Susan is a memorable character, however, at first, I did not connect to Susan, not that I’m perfect in anyway, we all have our foibles, I rolled my eyes at lot at Susan’s way of thinking. I liked that Susan was a strong individual, she was not waiting for anyone to rescue her or save her. The story is interesting and insightful, it explored Susan’s past and her future. I enjoyed that despite Sarah seeing herself ‘different’ and not needing friendship or any type of relationship, she did have people that cared about her. I hope to read more books by Sarah Haywood. Thank you to NetGalley and Harlequin Publishing for gifting me with an ARC of The Cactus by Sarah Haywood. In exchange I am providing my honest review and opinion. This book was a joy to read!!! Charming and delightful but not sappy or mushy.Like the surprising sabra, a sweet fruit that grows from the prickly cactus, our protagonist Susan is a bit thorny and sharp on the outside but inside she’s full of pure, satisfying originality. Susan’s voice was reminiscent of another unique protagonist, Ele Thank you to NetGalley and Harlequin Publishing for gifting me with an ARC of The Cactus by Sarah Haywood. In exchange I am providing my honest review and opinion. This book was a joy to read!!! Charming and delightful but not sappy or mushy.Like the surprising sabra, a sweet fruit that grows from the prickly cactus, our protagonist Susan is a bit thorny and sharp on the outside but inside she’s full of pure, satisfying originality. Susan’s voice was reminiscent of another unique protagonist, Eleanor Oliphant and while I’m sure comparisons will be made, Susan deserves to be applauded on her own merits.